Submitted by David Hey, whose own photo collection can be seen here, a picture of non-superheated Precursor, no. 1, at an unknown location. Does anyone know where this is? An interesting looking vehicle behind the engine too! Any thoughts on that? First thoughts - the Signals look GWR to me. I think this is Poulton-le-Fylde, on the LNWR and Lancashire & Yorkshire joint line. If so, the train has come from Fleetwood or Blackpool (Talbot Road) and is headed for Preston and beyond. A lot of railway photographs were taken in this area by J. M. Tomlinson, who lived at Poulton, so this may be one of his. On my print the station name on the lamp just behind the safety valves is clearly legible and the name reads Poulton. Well done Harry. The coach looks to be a Midland vehicle, so is this a seaside special from the East Midlands? The bank with the hedge on top and the very tall telegraph poles certainly fit with Poulton. I think that the carriage is in fact GWR rather than Midland. The clerestory roof seems too wide for MR. 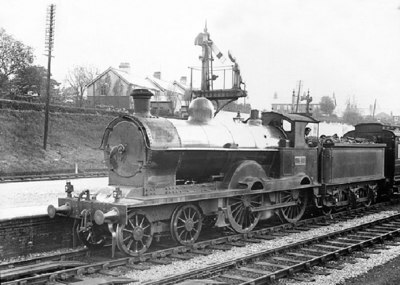 It is in the lake livery used by the GWR from around 1912 onwards. Mystery Photo No.71 is an enlargement of this print.